Full color pages with large row by row charts and written directions for charts. 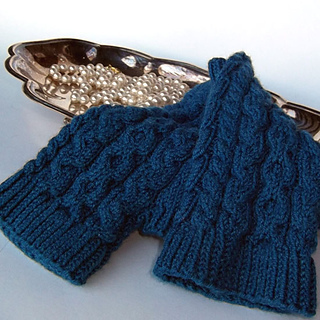 Delicate cables and twisted ribbing make these wrist warmers nice and stretchy, so they stay on when you wear them! I have been wearing a version of these for years, originally knit in a 100% cashmere yarn. 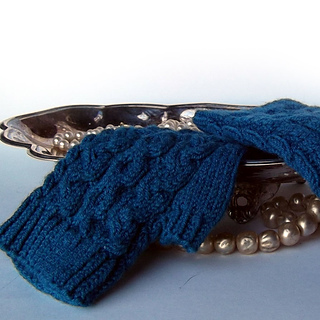 To help keep the wrist warmers from stretching out, this version is knit in a sock weight yarn with silk, which adds a beautiful sheen to the cables! 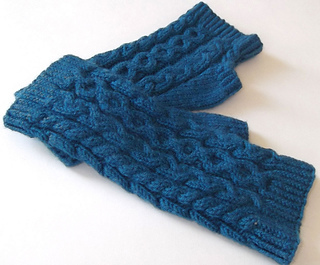 The wrist warmers have identical cables on the top and palm sides, making the wrist warmers identical for both right and left sides. Knit from the bottom up with simple increases for the thumb gusset. Finished size 6 inches around and 8 inches long, stretches to fit circumference 6-10 inches around. Thumb stretches from 1 ¾ to 3 inches around. Available in print from Magcloud: Euphony Print.